I had originally come up with an inventive and funny way to start this post. I was going to draw a parallel between myself and Joey Tribbiani from “Friends”, as we both share an intense love of sandwiches. I scoured the internet for a clip I can so vividly remember, but could not find it. When quizzed about his favorite food (which many people assume is pizza), we learn that his favorite food is in fact, sandwiches! For those of you that weren’t fans of the show, “Friends” (all 3 of you) – Joey Tribbiani is a fun-loving, womanizing, “foodie” who craves [among other things] sandwiches. Perhaps this love of meat and cheese folded between two pieces of bread comes from his Italian heritage, because as I’m learning – Italians have perfected the art of the sandwich (hereafter referred to as panino or the plural – panini). On Sunday, Jen and I decided to go to Milano – a forty-five minute drive from our hometown in Como. Jen had heard about a wonderful flea market that is only open the last Sunday of every month. We bundled up with lots of layers and departed at the wee-early hour of 11:00am (and that was rushing to get out the door). On the way, we consulted the internet to tell us what else to do for the day and found out about a wonderful restaurant with over 100 types of panini. We cross-referenced Trip Advisor and read some wonderful reviews of the food. In my mind, it was a lock we were headed to Bar della Crocetta for lunch! 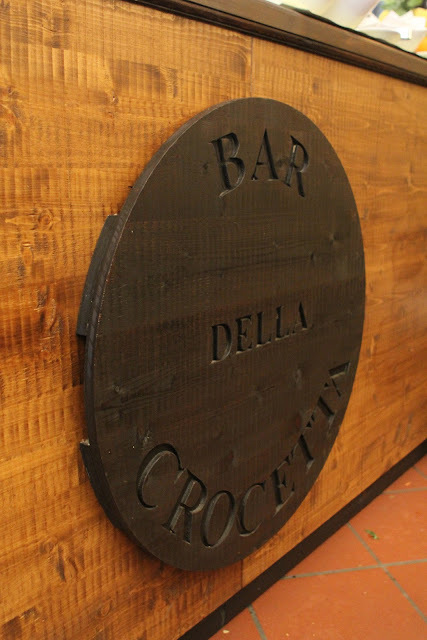 By the time we finally got to the flea market (after a few wrong turns), it was already time for lunch – so instead, we re-routed the GPS to Bar della Crocetta. 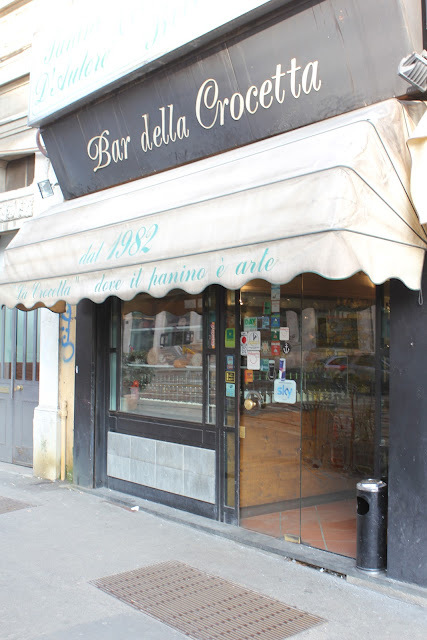 When we walked in, we were greeted by several friendly, buon giornos and found a nice cozy spot in the corner. After reviewing the menus for several minutes (in both Italian and poorly translated English), we gave up and asked our friendly server to help us pick two sandwiches and something for Julia. Her selections were wonderful. And since Julia didn’t want to wait for her panino, they gave us a plate and told us to help ourselves to the bar full of food. Our excitement grew as we watched delicious panino after panino come from the kitchen. We were not disappointed! AMILACARE – golfetta (salami), brie, scamorza cheese, lettuce, tomato, etc. BIG – prosciutto crudo, fontina cheese, shrimp, lettuce, tomato, etc. We couldn’t be happier. Julia jumped right in and preferred to take big bites on her own as opposed to the small pieces her mom cut for her. When we were winding down, Julia was just getting started! She decided she didn’t want any more of the prosciutto cotto (cooked prosciutto, basically ham) and wanted her favorite… salami! If I can ever get the video to load properly… we have a funny video of her demanding salami after her first discovery of it’s deliciousness! We could hear the staff laughing and repeating her cute request of salami – or as she says it… “lami” (here’s a video of her requesting it). The trouble was, we had already finished our sandwiches. What we didn’t know was that they weren’t just discussing her unique accent – they were actually putting together a plate of her own salami. With our bellies full and our moods elated… there was only one thing left to do in order to finish the meal. Have our espresso!! I’m pinning this so I don’t forget it for my next trip to Italy! How cute; sounds like you have a “foodie” in the making! I have to ask Sara if she likes panini so we can increase the number of foods we can make for her. Wow, 100 different panini; I am not a big sandwich fan but I do like Italian panini. If we ever get to Milano, we will have to go there to try one. Thanks for sharing.